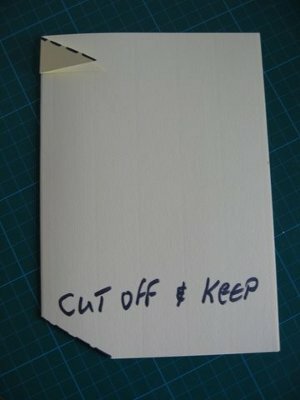 Take a piece of A4 card then score and fold it in half. 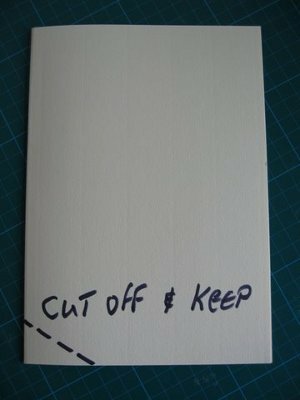 Use the same snipped off piece at the right hand side of the card to create the slope for the pages and snip off. From the end of the slanting line on the left mark a parallel line to the right outside edge of the card. 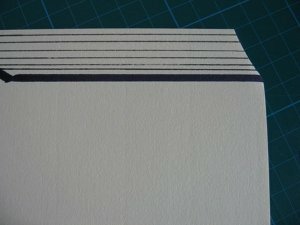 Then make several ruled lines along the top of the card, from the left slanted line to the outer edge. And that's it your done ... Easy Peasy! 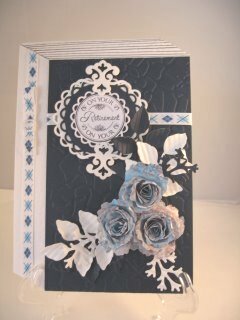 Here is what I did with my Faux Book Card. I used gold peel offs along the page edges, and made a gold panel to fit along the spine part of the "book". 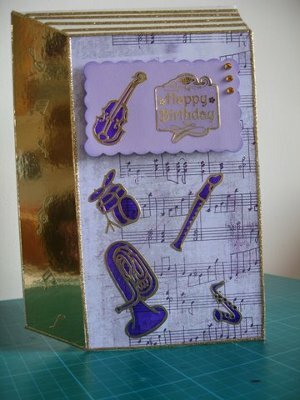 A little scalloped panel, raised up with foam pads, is added to the front and peel offs and gemstones decorate it. The other music peel offs are added randomly to the front of the card and then coloured in with Sakura pens.